Supply Chain Integration for "Excellent Organizations"
This article is the analysis of current developments in the field of supply chain strategy in the food industry. A number of recommendations give direction to food companies to become “excellent service organizations”. Later the Internet revolutionized the value chain by the hype around online food retailing and the more serious introduction of Business-to-Business e-commerce and the introduction of “Collaborative Planning, Forecasting and Replenishment”. This article will show the impact of these developments on organization and necessary abilities of employees and systems. Key benchmarks for this article are Wal-Mart, Ahold, Tesco, Wegmans, Unilever, Procter & Gamble, Sara Lee, Nabisco, Rituals and Coca-Cola. Supply chain management has evolved from business necessity to one of the primary focus areas for enhancing competitive advantage. Imagine a virtual organization that encompasses a group of trading companies, all working together to maximize customer service, slash costs and share the profits. By optimizing not only their internal processes but also their interactions with each other, they realize benefits of a truly integrated supply chain. This concept is basis for the revolution in development of supply chain integration and synchronization, to create “excellent service organizations”. In the 1980s and 1990s, most companies focused their supply chain initiatives on reengineering supply chain cost structures. These initiatives were driven primarily by corporate restructuring and internal improvement as company strategies responded to the accelerated opening of global markets. In this decade we see a new driving force in corporate strategy: delighting customers. Customers have become increasingly demanding, expecting ever-higher levels of product and service performance. Gradually, in industry after industry, customers are coming to expect greater customization of products and services to their individual needs. At the same time, they are also used to a constant stream of innovations in the goods and services they use that either reduces the cost or improves the benefits they receive. Through intra-company optimization, companies have engineered and reengineered their business practices to enhance overall performance. By implementing internal system solutions such as ERP and supply chain planning and -execution systems, company management can make informed business decisions. Intra-company optimization extends real-time information throughout the organization, ensuring synergy among operations, finance, sales, purchasing and customer service. This allows all departments to work as a cohesive unit lowering operating costs and maximizing customer satisfaction. Unfortunately, intra-company optimization often pushes costs out to the disadvantage of trading partners upstream or downstream. While the globalization of many industries has created many opportunities for the participants, it is also bringing to the customer competitive products and fresh alternatives that further increase the customer’s expectations. Product quality no longer provides competitive advantage that it did earlier in the decade; it is merely considered a qualifying factor as customers choose from a wide range of fairly equal alternatives. Customers are beginning to demand same levels of quality, not just in products itself but also in delivery of that product and services that are packaged with it. Concentrate on communications with consumers, not just promotions. The new change of focus in marketing is illustrated by the development of one-to-one marketing to enhance customer retention, new interest in activity based management to measure process profitability and customer profitability, success of new convenience store formats like Starbucks and use of Internet for communication with consumers, to improve the relationship with customers. This new focus in marketing translates to a new direction in supply chain management: “market driven logistics”. For any company customer retention is a key determinant of long-term profitability. Customer retention is built on quality of the relationship with customers, and this quality is driven by a high degree of satisfaction with service received. Customer service is a broad concept. It encompasses all points of contact between a supplier and a buyer. Excellent service organizations require a detailed understanding how customers themselves define service. It is not sufficient to rely on internal customer service definitions, but an excellent company needs to understand individual needs of each customer or customer group. Once that understanding exists than strategies can be devised and systems developed, to meet or preferably exceed customers’ expectations. Traditionally most customer service performance indicators measure the internal effects of processes: stock availability, inventory sales rates and percentage of lines shipped in relation to lines ordered. The absolute rates of these performance indicators are related to the trade-offs between costs and out-of-stocks. This approach leads to the comfortable idea of an “optimal service level” of 98 %, which is a trade-off between reasonable out-of-stocks and low inventory levels. In modern supply chain management a service level of 98 % means nothing less than a failure rate of 2 %. A failure rate of 2 % is not acceptable in matters of life and death. A failure rate of 2 % in a hospital means that 40 babies die every year because they fall on the floor. A failure rate of 2 % in a power utility means, that households (and hospitals) have no electricity for 7 days a year. The message is that maximum customer service is a matter of life and dead for any company in the current competitive environment. 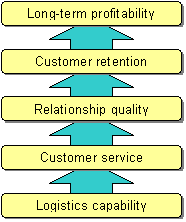 In this simple example customer service index is computed by multiplying the service levels of individual service elements. If the score of each element is 98%, score of the index is 94%. Supply chain integration is the effective and efficient road to maximizing customer service index. By integrating processes of different links in the chain it is possible to prevent problems in an early phase. The result is a very low multiplier effect of failures and moderate prevention costs. Also the levels of interface stocks can be greatly reduced, adding to the cost savings. A famous one-liner to describe this development is “to substitute inventory by information”. At the heart of ECR was a business environment characterized by dramatic advances in information technology, shifts in consumer demand, and increasing movements of goods across international borders aided by the internal European market. This new reality required a fundamental reconsideration of effective ways of delivering the right products to consumers at the right price. Non-standardized operational practices and rigid separation of traditional roles of manufacturer and retailer threatened to block the supply chain unnecessarily and failed to exploit synergies that came from powerful new information technologies and planning tools. To better serve consumers, ECR set out to invert traditional models and break down non-productive barriers. Impacts were extensive and continue to resonate across the food industry. They are an integrated set, not standalone ideas. Benefits gained from individual concepts are multiplied by combining them with complementary ideas and methods. ECR is an integrated approach of marketing, logistics, finance and information technology. This effort will break down barriers between departments in companies to improve efficiency and effectiveness. All of the concepts are viewed from the perspective of the total value chain. Efforts are focused on effects for consumers, not just business of individual trading partners. Trading partners will work together to maximize effects. Retailers and manufacturers in North America, Europe and Australia experience the benefits of working together in category management projects and optimised promotion projects. Manufacturers contribute their knowledge of brands, products, consumers and channels. Retailers contribute their knowledge of store marketing and shopper behaviour, including detailed point-of-sale sales data. These projects have a well-defined structure of goal setting, defining the scope and structure of the category, internal and external assessment, mapping the assortment, defining the improvement plans and testing and executing the new plans. In a typical American or European store, 22 % of items are sold less than one per month. Most of these slow-moving items have perfect substitutes. Typical results of a successful category management project is the deletion of 20 % of redundant products, introduction of 10 % new products that add value to the category, an increase of sales of 10 – 20 % and an increase of net profit of 15 – 25 %. Learning experience of these projects creates improved long-term working relationships of retailers and manufacturers. Optimising promotions is an improvement concept of ECR with great potential but less spectacular results. In the USA coupons and other price promotions sometimes have a devastating effect on the efficiency and lead times in the supply chain, especially because of forward buying activities of retailers. Potential financial savings of decreasing inventory levels in the total supply chain from 3 months of sales value to 1.5 months of sales value are very high. There are however stiff legal constraints in the USA that prevent trading partners of sharing information with individual trading partners and reach maximum collaboration results. In Europe the practice of forward buying is less evident, but here promotion activities often are not well planned and executed. This means that there is great potential to increase promotion sales and decrease costs. This potential is fully explored by retailers like Wal-Mart in the USA and Jumbo in the Netherlands. These companies introduced Every Day Low Pricing as cornerstone of their store formats, showing spectacular increases of sales and lower logistics costs. The supply side of ECR addresses continuous and rapid replenishment of products and related information through the entire supply chain, driven by actual sales in the stores. In the first phase of ECR, scope of work was limited to product flow from supplier warehouse to stores, and introduction of computer aided ordering in the stores. These two improvement concepts had a tremendous impact on stock control in the stores. The second phase the flexibility and reliability of production is increased, to enhance benefits of computer aided ordering by the stores. The third phase is to link suppliers of packaging materials and ingredients to the information flow in the entire chain, to maximise results. The result is quality improvement in combination with cost reduction: service levels and speed of deliveries increase with lower inventories in most parts of the supply chain. Application programs: scanning data collection and analysis, customer order management, capacity planning, inventory control etc. ECR improvement concepts often require investments and expenditures in one part of the supply chain (mostly manufacturers), which result in additional profits in other parts of the supply chain (mostly retailers). 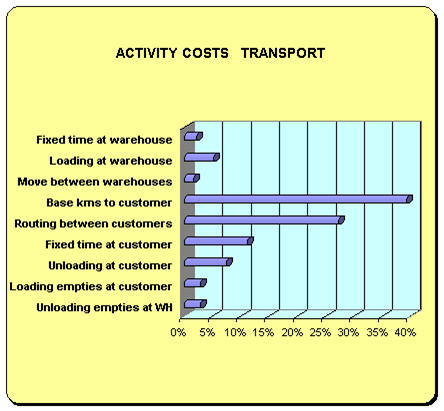 Activity Based Costing is a necessary tool to measure the costs and profits of ECR activities. A professional ABC analysis is often used as a basis for negotiating the redistribution of these costs and profits. A good example is the introduction of the Rolly/Dolly transportation device by Coca-Cola. This investment of Coca-Cola results in handling savings by retailers, who are willing to pay a higher price that covers additional costs of Coca-Cola, but which is lower than savings by retailers. The use of cost/profit analysis in the supply chain is also an important driver for changing distribution practices, to meet increasing service demands of customers at higher labour costs and transportation expenditures. Recent developments in information technology, and particularly the Internet, have created an explosion of the potential economic value of collaborative initiatives. The new form of collaboration is “Collaborative Planning, Forecasting and Replenishing” (CPFR). With this type of collaboration, a retailer and a manufacturer share sales forecasts via two-way interactive communication links. Nabisco, the largest cookie and cracker maker in the United States, has developed CPFR in a pilot program with Wegmans, a Northeastern supermarket chain. These trading partners exchanged planning data of promotion-rich product categories, in order to reduce inventories and out-of-stocks, and increase sales. The success of these pilots has been an inspiration for different companies in the United States and Europe, to start a number of e-marketplaces. Nabisco started “Transora” together with Unilever, Sara Lee, Procter & Gamble, Nestle and 50 other manufacturers. Nestle also works together with Danone in another more European oriented initiative: “CPGmarket”. The French retailer Carrefour started “GlobalNetXchange”, together with Sainsbury, Sears, Kroger and Metro. Other retailers like Ahold, Delhaize, Tesco and Safeway have started “World Wide Retail Exchange”. Recently Transora and GlobalNetXchange started integrating their networks, in order to make it possible to integrate suppliers, manufacturers and retailers. 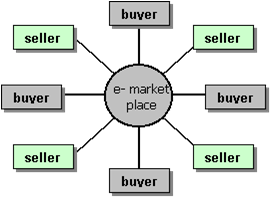 Most important characteristic of e-marketplaces is the use of a centralized network, instead of the traditional one-to-one communication by mail, telephone, fax or EDI. These e-marketplaces still have to prove their added value in the supply chain. They have potential to change all processes in the value chain of both retailers and manufacturers. If we focus on the relationships between manufacturers and retailers, the standardized retailer information will help manufacturers improve their planning of sales, production and transportation. Also product development and marketing will be able to benefit. Effects for retailers are also complicated, because improvement areas are in different processes within the value chain: exchange of point-of-sale information with manufacturers will improve logistics service levels and reduce stocks and simultaneously reduce out-of-stocks. Short-term effect for retailers is a reduction in procurement costs and improved planning and execution of promotions. Indirect effect of reduced stock levels in the stores is the possibility to add assortment and increase sales and margin. E-marketplaces and CPFR are typical examples of business-to-business (B2B) integrators. New developments of business-to-consumer (B2C) e-commerce are also impacting the supply chain for both retailers and manufacturers. The Webvan case is particularly interesting, because it used to be an example of logistics excellence and customer service for many Internet gurus. The downfall of the market capitalization of Webvan by 98 % of its top is a clear indication that there is actually something wrong with this business model. The problem is that the business model of almost any pure online food retailer is a disaster area for investors and entrepreneurs. The use of Activity Based Costing has shown, that supply chain costs of pure online food retailing are twice (double!) the supply chain costs of traditional food retailers. Added value for average consumers is only one-third of the added costs for online food retailers. Most online food retailers are then caught in the same trap: reducing the extremely high order fulfillment costs means high turnover; high turnover means low prices and high service; low prices and high service means a very negative bottom line. 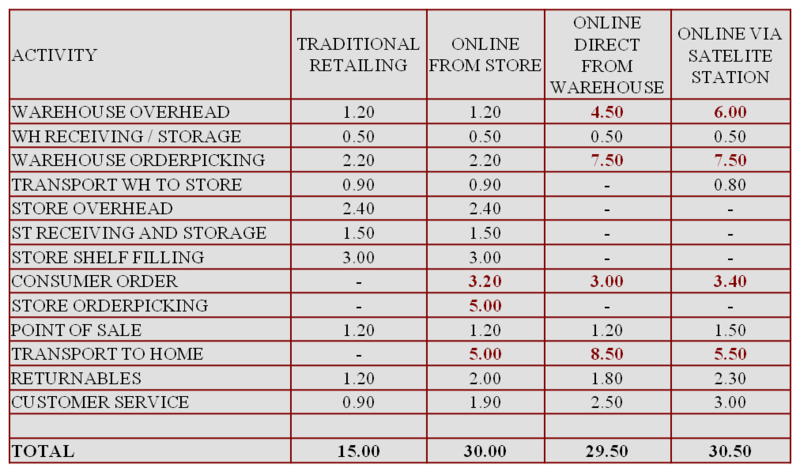 Distribution costs of online food retailing are twice the distribution costs of traditional supermarkets. Traditional channels are extremely efficient, because consumers do most of labor-intensive work for the retailer: order-picking in the store and transportation of goods to the home. Costs of these activities are approximately 10 % of the consumer price. Online retailers have to pay well-trained and professional employees to do this work without errors. An additional 5 % of costs are spent on information technology, order management and after sales service. Additional costs are much higher in case of low market penetration or sub standard execution. The next table is an overview of supply chain activities and cost structure of each scenario, including traditional retailing. Figures are costs per activity as a percentage of consumer value. Source: Cost/profit analysis by Retaileconomics.com. [This cost structure is an indication only. In each country and in every situation the costs per activity will differ. Outsourcing the delivery process to logistics service providers may add efficiency but also increase complexity costs]. Niche marketing is focusing the marketing mix on a special target group. This strategy is particularly effective for traditional retailers with a high market share and an affluent customer base. These retailers can develop an online channel as service offering, as market development strategy and as barrier against new entrants. In the USA this would be the recommended approach for successful local chains, in the UK for Tesco and in The Netherlands for Albert Heijn. A focus on margin rich products is the most debated solution for online food retailing. This assumption about consumer behavior is not supported by practical findings. In practice consumers will try to order enough products to avoid the delivery fee, in most cases set at an order amount of above 50 US$ or the equivalent in Europe. For online retailers the sale of mainly bulk products is the quickest road to bankruptcy, since these products are the loss leaders of the grocery business. There are already many examples of a clear product focus in online food retailing. The best example is wine. This product group is often the only food group of general merchandise online retailers. Another important online food group is vitamins and supplements. In the USA there were some very attractive examples: Wholefoods.com and Vitamins.com. The Belgian food retailer Colruyt used non-food not only as an important margin rich extension of the food assortment, but also as a traffic builder for the supermarkets. Consumers can order the non-food articles online, but have to collect the merchandise from the store. Information distribution and communication is the name of the Internet game. Internet is the perfect channel for targeting different consumers and other stakeholders of the company. The other major advantage of Internet is the ability to really communicate in two directions. This important feature of Internet will have a great impact on the internal and external organization of any company. The company “Rituals” combines these three opportunities into one new brand. Rituals is developing margin rich niche products with a message. The company is selling these products in its own single brand stores and by the Internet. All initiatives described in previous chapters require various levels and types of cooperation among supply chain partners, ranging from transactional to interactive and interdependent. Transactional or operational relationships do not require much shared information or decision-making, therefore, they should not be difficult for most partner companies to implement. A more interactive relationship, however, requires shared information, some joint planning and some shared decision-making. Such a relationship requires deeper cooperation, the willingness and capacity to learn new skills, and varying degrees of trust. In this case, the boundaries between companies become blurred, information (proprietary or otherwise) is shared extensively, as are decisions, investments, and assets. Value of goodwill, candor, and skill required in such interdependent relationships cannot be overemphasized. In fact, most companies that are not near this level of cooperation today would require radical transformation to achieve a successful relationship with multiple partners. Supply Chain collaboration on a strategic level deals with structural design and configuration of the relationships between an enterprise and its suppliers and customers. Scope of activities includes customer segmentation, channel design, postponement approaches, network design, customer service territory planning, sourcing, service and supplier contract negotiations and joint product development. In the food sector Wal-Mart has strategic type relationships with large suppliers, which co-manage store marketing of categories and inventory levels in the stores. Supply chain planning encompasses activities such as planning and coordination of procurement, production, distribution, demand, transportation, load building, supply-demand matching, product allocation, and available/capable to promise functions. The scope of this definition should be expanded to also include activities associated with the tuning and steering of execution activities based on monitoring and feedback as the plan is executed. In the food sector the implementation of “Collaborative Planning, Forecasting and replenishment (CPFR) is a good example of this stage of working together in the supply chain. 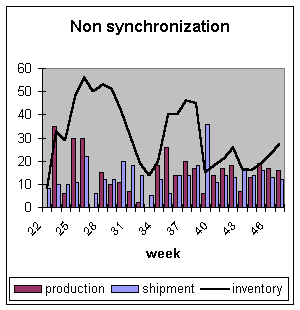 The effect is synchronization of sales, physical distribution and production. 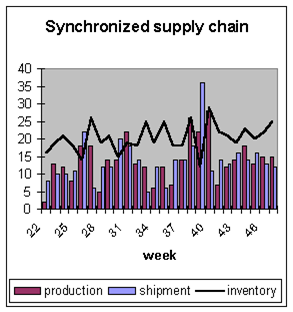 The result is higher speed and lower inventories. Collaborative capacity planning processes allow suppliers and customers to work together to decide how a supplier’s capacity can be allocated to provide mutual benefits to both parties. Supply chain planning will continue to evolve to better support a synchronization strategy. In particular, the processes that affect the cross-enterprise activities are at an early stage of development and in most cases are uniquely designed to fit the specific situation and relationship. These processes will evolve over the next few years to become more widespread, commonly understood and standardised. Operational supply chain collaboration includes day-to-day transactional activities such as order management, billing, financials tracking, inventory and material and other resource tracking. While coordination at the execution level has existed in some form for some time, for instance EDI, proliferation of Internet as a low cost means of communication (with specifically low ramp-up and switching costs) has energized such activities enormously. Consequently, much of existing focus on Business-to-Business collaboration has been in the operational area. For example, consider sharing of information such as manufacturing work-in-progress between business partners and new web-based procurement processes commonly called e-Procurement. Availability of process-specific software has been a key enabler of these developments. Most current collaborative programs are best described as “joint participation” programs. Customized pallets, reverse logistics and vendor managed inventory (VMI) initiatives primarily focused on one-to-one and/or transactional relationships. While these tactics are necessary, they are not sufficient to generate substantially increased shareholder value. Findings of a study of the Logistics Council suggest six supply chain strategies that have been highly successful and have unique supply chain structures and characteristics. Focuses on generating high profit margins through strong brands and forceful marketing and distribution. This is the strategy of successful A-brand suppliers like Coca-Cola, Sara Lee, Procter & Gamble, Nestle and Unilever. Especially Unilever has drawn attention by eliminating many minor and local brands in order to focus all attention to strong international brands. Configures assets and operations to react fast to emerging consumer trends along lines of product category or geographic region. Tesco UK and the global Ahold Company are both retailers that have build systems giving stores the opportunity to respond to local customers. Both assortment and shelve presentation are systematically adapted to actual local sales, and replenishment is executed using computer assisted ordering. Uses mass customization to build and maintain close relationships with end consumers through direct sales. A perfect example outside the food sector is PC company Dell. Within the food sector we already described the example of the Unilever Company investing in the new brick-and-click company Rituals. This strategy puts a priority on “low price, best-value” for the customer, but it focuses less on brand than on dedicated service. This has been the priority strategy of private label manufacturers and “Every Day Low Prices” (EDLP) retailers. Some of the most successful retailers in the world use this strategy: Wal-Mart in the USA and Aldi in most countries of Europe. Emphasizes a balance of supply chain efficiency and effectiveness. This last strategy has been used by many of the middle of the road retailers. It appears that the Value for Money focus is superior to logistics optimization, because it starts with customer value and supply chain service, and then optimizes the operation. Each of these six supply chain strategies can be powerful when aligned to a business unit’s overall strategy. However, only collaboration between multiple trading partners will yield a synchronized supply chain. This often maximizes end consumer value proposition and ultimately value to each trading partner. Demand generation requires new internal and external communication skills of all employees that have contact with customers. Each complaint must be handled as a free advice of an emotionally involved customer to improve the service levels. Complaints must also be considered prove of structural problems, not of incidents. Demand generation also requires a feeling how to translate customer data into valuable triggers for action. Questions and orders must be communicated internally to the right person, who will deliver results. Demand planning also requires shared information and systems to work with shared information. Purchasing will no longer aim for lowest prices, but this function will have to be able to reduce total transaction costs by cost/profit management. This is not easy, but proves to be very rewarding. These requirements are still expressed in a very general way. Each company that takes supply chain integration seriously will have to develop a practical plan to develop these new abilities. Often the implementation of new systems will guide existing workers into the new direction. It is however very clear that there often is a need to hire experienced workers and replace the existing employees. 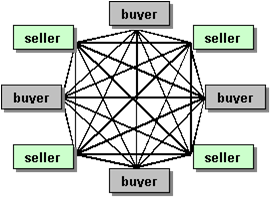 Also the introduction of integrated supply chains often means the participation of financial experts to guide trading partners that work together in projects to optimise the entire supply chain by investing in one company and getting the benefits in another company (mostly the customer). Many technology initiatives for supply chain companies have been focused around implementations of Enterprise Resource Planning (ERP) systems. Driver in these cases is often replacement of legacy technology to provide a common technical architecture and financial system across the entire company. Value provided to the supply chain operations has typically been standardization and automation of processes. These implementations while enormously complex and cash consuming, have centered on a single ERP vendor and had limited impact on supply chain performance. Convergence and expansion of enterprise resource planning and supply chain planning software markets means it has become easier to provide integration of information across multiple supply chain activities and other business systems within the company. Also the rapid evolution of Internet has provided an open technical architecture to support business-to-business collaboration efforts. It has the potential to interactively share a much more diverse and broadband of information than the traditional EDI methods. Perhaps the most important component of an Integrated Supply Chain strategy is helping people adapt to new operating realities of cross-supply chain partner collaboration. 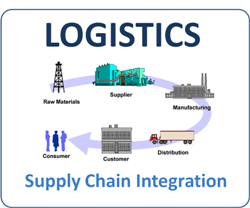 Second, core capability teams (consisting of supply chain partner company professionals) must be focused on key Integrated Supply Chain activities (for example, integrated supply/demand planning from consumer back to suppliers), which synchronize activities across the supply chain. Finally, the journey to success must be clearly understood and articulated by senior executives charged with making integration and synchronization happen. Strategy must be an integral part of a new “cross supply chain culture”, shared by all partners. Lack of common values, behaviors and beliefs will endanger the entire journey. Inter-company business process integration in its purest form gives rise to the virtual organization, where all trading companies work together as one competitive supply chain entity. In the virtual organization, each trading company shares its information and resources, resulting in better planning and more efficient product movement. All of the initiatives mentioned for supply chain synchronization require some level of relationship building. The idea of supply-chain “partnerships” has been discussed frequently for the past several years. Task of building new kinds of relationships is, by nature, imprecise. This human factor can be most challenging of all the requirements. Skeptics may see the concept as unrealistic because of the complexity involved in true supply-chain partnerships and the difficulty of establishing genuine trust among potential partners. However, there are proven methods to circumvent the difficulties as results have shown. First the CEO’s of trading partners that work together must fully support the strategy of supply chain integration. This has been the function of high-level ECR conferences of the last years: to enhance the support of top-managers of A-brand suppliers and food retailers in North America, Europe and Australia. Second the acceptance of new improvement concepts is accelerated by well-prepared and well-managed pilot projects. Their function is to get different functional managers acquainted with the new concepts, and often generate quick-wins that speed up the acceptance in the organization. Third it is necessary for long-term success and for “projects to change into process”, to clearly define goals. These goals should be aimed at the four parts of the “balanced scorecard: financial goals, customers, employees and processes. It is also very helpful to divide goals into performance goals (effective activities) and results. The next table shows an example of a balanced scorecard of supply chain integration. Building a benefits structure that balances rewards with each partner’s understanding of their contribution is crucial to maintain close partnering relationships. A significant barrier to widespread collaboration is the absence of a generally agreed upon framework for equitable revenue and cost sharing amongst all participants. The price that an end-consumer pays is indicative of the total value the consumer places on the sum total of all activities associated with that product throughout the supply chain. In the food industry there is significant variability in margins each participating member makes in a complete supply chain. How should one allocate value and thus margin that each participant makes from a single end-consumer transaction? Some successful examples of collaborative supply chain planning have been driven by those providers on front-end, like Wal-Mart in the USA and Albert Heijn in the Netherlands, that have market power to elicit desired behavior from upstream members of the chain. However, this issue will grow as continued componentization of the business infrastructure increases the number of choices available and advances in technology drives down switching costs for changing business partners. Any effective benefit structure is based on Activity Based Costing (ABC). The latest ABC models make it possible to calculate costs and effects of the implementation of complex supply chain improvement concepts in the entire supply chain. Including net effect of each trading partner. To keep things simple we will use the example of the transportation process between an A-brand supplier and the central warehouses of different retailers. In this example the highest costs are the costs of driving from the supplier to the first customer (“base kilometers” are 38 % of total costs) and driving between customers (“routing” is 27 % of total costs). There is a multitude of improvement concepts to lower costs (beneficial to the supplier) and increase the service level (beneficial to the customer). The advanced ABC model makes it possible to compare all alternatives. An analysis of supply chain economics examines the role and costs of each of the different supply chain participants. If this examination can be driven down to detailed practices and performance metrics, then each participant’s competitive advantage can be understood. Establishment of integrated supply chains is often challenged by participants’ unwillingness to relinquish any degree of control, which is a symptom of lack of trust among trading companies. As dependencies among companies increase, tolerance for errors decreases. For example, a manufacturing facility that schedules materials to arrive in a Just-In-Time (JIT) environment may have to shut its assembly line down if weather conditions prevent materials from arriving on time. On the other hand, JIT environments normally enable manufacturer to continuously deliver desired products at a lower cost to consumers, so advantages outweigh challenges. Lack of trust among companies will hinder acceptance of supply chain integration, while lack of standardized communication and business processes will hinder implementation. Inertia will set in if a company believes it must change all of its key operations and systems to attain benefits of inter-company business process synchronization. Frequently, adoption of a single technology will not suffice; instead, many technologies must be implemented and synchronized simultaneously. To keep the faith among trading companies, no one business should ever implement a system that takes control of inter-company supply chains. Control needs to be distributed as equally as possible to make inter-company business process synchronization succeed. Finally, while some integration can be achieved by forcing a weaker partner to simply become unwilling victim of cost and value shifting. In general, this is not a sustainable proposition, and it generates longer-term total supply chain inefficiency. Cooperation is the cornerstone of successful integration, and there is more value that can be achieved through positive communication than through coercive alignment. Opportunities to create value through synchronization of supply chain activities are so great and timing so appropriate that it poses a very interesting dilemma for prioritization of improvement initiatives within a supply chain. In an environment of constrained budgets, there is a difficult choice between improvement investments for the internal processes of an organization or tackling the inefficiencies at the business interface with customers and suppliers. The answer will depend on circumstances, but in many cases it will be surprising, as integration and synchronization across supply chain partners will likely yield the highest returns and largest increases in customer satisfaction. A more practical approach is to identify areas of inefficiencies within the supply chain that, if streamlined, could better satisfy consumer demand. Next, determine how re-engineering would affect intra-company operations, and subsequently, identify the systems required. In most cases, these support systems focus on supply chain planning/forecasting and/or physical logistics of products.